Berry compound may inhibit breast cancer and heart disease. Blueberries are packed with healthful phytochemicals such as pterostilbene, which has been shown to lower cholesterol in some lab animals. You may not have heard of pterostilbene (pronounced “tero-STILL-bean”) yet. But this berry compound’s prospects for inhibiting breast cancer, diabetes, and LDL cholesterol in humans may soon make it as well known as other health-enhancing natural substances. Standing to reap benefits from pterostilbene’s renown are producers of blueberries and grapes, two fruits known to contain this compound. “The more we study pterostilbene, the more we see its huge potential in the human health field,” says chemist Agnes Rimando of ARS’s Natural Products Utilization Research Laboratory in Oxford, Mississippi. Her animal studies on the compound have led to several groundbreaking discoveries. Pterostilbene is one of many aromatic hydrocarbons called “stilbenes.” It’s a derivative of resveratrol, a compound found in large quantities in the skins of red grapes. Resveratrol burst on the health scene more than a decade ago, when it was found to have cardiovascular and cancer-fighting benefits. Studies at the time examined resveratrol’s role in an apparent phenomenon in which people in France live long lives despite diets very high in saturated fat and cholesterol. It has been theorized, though not yet proven, that red wine’s prevalence in the French diet lowers incidence of cardiovascular disease. Originally isolated from red sandalwood (Pterocarpus santalinus), pterostilbene had already been touted for its fungicidal and antidiabetic properties—and showed potential for lowering blood glucose—when Rimando started experimenting with it in the early 1990s. Through experiments using mice, rats, and hamsters, Rimando and collaborators have since helped add chapters to what’s known about pterostilbene and what it can do. Rimando and UIC collaborators made a huge discovery in 2002, when—in tests using rat mammary glands—they found that pterostilbene possessed cancer-fighting properties at similar effective concentrations as resveratrol.Also in that study, Rimando, Oxford plant physiologist Stephen Duke, and scientists at the University of Buenos Aires in Argentina found that pterostilbene is a powerful antioxidant. Then, in 2004, Rimando solidified pterostilbene’s standing with two major announcements to the American Chemical Society. First was the finding—with colleagues in Agriculture and AgriFood in Canada, Oregon Freeze Dry Inc., and North Carolina State and Idaho State universities—that pterostilbene had been detected for the first time in some berries of Vaccinium, a genus of shrubs that includes many types of berries. 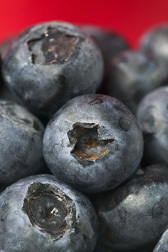 The research revealed that blueberries are a ready source of the compound. Pterostilbene was already known to exist in very small amounts in red-skinned grapes. Using gas chromatography/mass spectrometry, chemist Agnes Rimando analyzes pterostilbene content in blueberries. Then, Rimando announced that pterostilbene can help lower cholesterol and prevent heart disease. This conclusion was the result of animal studies Rimando did with colleagues at the University of Mississippi and with chemist Wallace H. Yokoyama of ARS’s Processed Foods Research Unit in Albany, California. The focus of this work was to determine the ability of pterostilbene and related compoundsto activate the peroxisome proliferator activated receptor alpha, or PPARa, a protein in the cell nucleus associated with metabolism that modulates blood lipid levels. Triglycerides, the chemical form in which fats occur in plants and animals, are a combination of three fatty acids with glycerol. As with cholesterol, elevated levels of triglycerides in the blood have been linked to cardiovascular diseases. Rimando and her colleagues found that the triglyceride-lowering ability of pterostilbene rivals that of ciprofibrate. The announcements generated a wave of attention for pterostilbene, not only in the United States but in other countries as well. At least two news organizations in Great Britain directly attributed a boom in British blueberry sales to Rimando’s findings. And the Oxford lab’s results have since been cited by companies marketing products ranging from blueberry extract to juice concentrate to commercially available pterostilbene itself. Cytochromes are found within the cells of animals, plants, bacteria, and other microorganisms that transport electrons. They’re also a factor in people’s varying response to drugs and toxins entering their bodies. Cytochrome P450 enzymes activate a variety of compounds known as “procarcinogens,” which can turn substances such as cigarette smoke and pesticides into carcinogens. “Pterostilbene showed strong inhibitory activity—much more than resveratrol—against a particular form of cytochrome P450,” Rimando says. “This may explain the cancer-preventive property it demonstrated in a mouse mammary gland culture assay.” But she warns that more studies are needed to explain this process as well as those of other trans-resveratrol compounds. As for where pterostilbene research goes from here, Rimando says, “I hope that some clinical studies can be conducted, either within ARS or by outside scientists, that will verify lab-animal results that allude to pterostilbene’s health benefits for humans.”—By Luis Pons, Agricultural Research Service Information Staff. 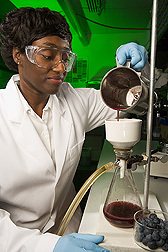 This work is part of Plant Biological and Molecular Processes (#302) and Quality and Utilization of Agricultural Products (#306), two ARS National Programs described on the World Wide Web at www.nps.ars.usda.gov. 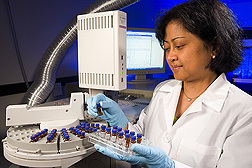 Agnes M. Rimando is in the USDA-ARS Natural Products Utilization Research Unit, P.O. Box 8048, Oxford, MS 38677-8048; phone (662) 915-1037, fax (662) 915-1035. "Pterostilbene’s Healthy Potential" was published in the November/December 2006 issue of Agricultural Research magazine.